Turkeys, the only domesticated animals from the New World that are now used globally, were actually domesticated twice -- once in Mesoamerica as was previously believed and once in what is now the southwestern United States. The new findings, reported this week by Canadian and American researchers in the Proceedings of the National Academy of Sciences, come from a DNA analysis of ancient turkey bones and coprolites, the polite name for fossilized excrement. Surprisingly, the researchers found that both strains of domesticated turkeys now are extinct, replaced by more highly inbred strains. The turkeys we eat today, moreover, are not descendants of the North American turkeys, but of those from Mesoamerica, which in a convoluted journey were taken to Europe by Spanish explorers, then re-exported to North America. The findings "have really helped to clarify some of the questions archaeologists have been wondering about for a long time," said archaeologist Jonathan C. Driver of Simon Fraser University in Burnaby, Canada, who was not involved in the research. It shows that the wild turkeys in the Southwest and Mesoamerica now "have nothing to do with the domestic turkey, that they are neither ancestor nor descendant." It also shows that there was only one breed of turkey in the Southwest, "that it was traded quite widely, and that its breeding was carefully controlled," he said. 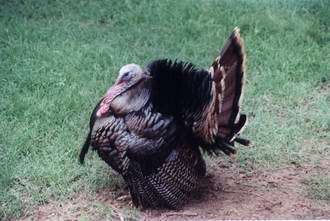 The history of turkeys is highly unusual in the context of other domesticated animals because it does not appear that they were originally raised in either region for their food value, as was the case with cows, sheep, pigs and other animals, said archaeologist Natalie Munro of the University of Connecticut, who has studied turkeys extensively. She too was not involved in the research. Evidence of turkey domestication in the Americas appears in remains from at least 2,000 years ago, but evidence from the first 1,000 years of that period suggests that the birds were raised for their feathers and ritual value, not for their meat. Middens -- essentially garbage dumps -- from the period contain "lots and lots of turkey poop and very few turkey bones," said archaeologist Brian M. Kemp of Washington State University, a co-author of the study. Bones found from the period are typically of intact birds buried under houses and elsewhere. All the evidence suggests, Munro said, that turkeys were raised for ritualistic purposes and for the use of their feathers for ornaments and in clothing, robes and blankets. "It gets really cold at night in the Southwest," Kemp said, "and turkey feather blankets are thermally superior to rabbit fur." A major change began in about the year 1100. Turkey bones began appearing much more commonly in middens. Archaeologists believe that this change was associated with the increasing population density of the region and the hunting to near extinction of desirable prey animals such as deer and antelope. By the 1200s, "turkey completely dominates the animal bones in middens," Driver said. The Pueblo people "were turning to an already domesticated animal and creating a new purpose for it." The dynamic changed again 250 years later after the Spanish arrived and introduced sheep and chicken. Turkeys began disappearing from the middens and soon were replaced almost entirely by the imported animals, which required less care. The new research came from two groups. Kemp and his colleagues at Washington State were studying DNA in coprolites from the two regions, while archaeologists Camilla F. Speller and Dongya Y. Yang of Simon Fraser were studying it in bones. They joined forces, and both approaches yielded the same results: that domestication was occurring simultaneously in the Southwest and Mesoamerica. The researchers concluded that domestication occurred at least twice: once in Mesoamerica, probably in south-central Mexico, involving the South Mexican wild turkey, and once in the Southwest involving the Rio Grande/Eastern wild turkey populations. They found no evidence that the two strains had ever intermingled. Analysis of DNA from turkeys purchased in stores in the United States and Canada showed that these were descended from the Mesoamerican strain and arrived in the continent via Europe, confirming what most experts already believed. Driver cautioned that these two strains were probably not similar to modern turkeys, which have been bred to bear so much meat that they can no longer fly. "They would be more like wild turkeys in terms of body shape. They wouldn't be very large or very fat ... but there was a reasonable amount of meat on them." Probing Question: What is a heritage turkey?